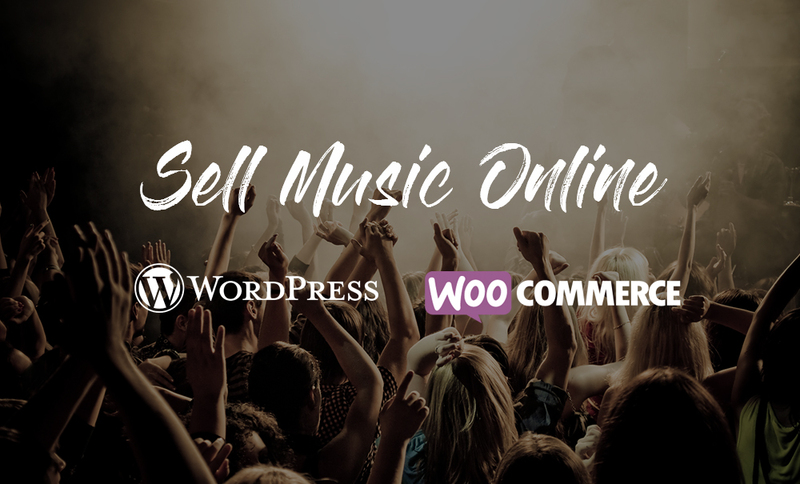 You might be aware of the fact or not, but you can actually sell music online with WordPress and WooCommerce. But How? Well, there are some simple steps or let’s say methods, that actually helps you to sell your music online. Here, I have pointed out the methods so that any newbie to WordPress and WooCommerce can easily set the whole things up and sell music online. The combination of WordPress and WooCommerce will ignite your online music website. If things are done right, you can actually turn your simple online music store into an income generating music online store. In order to gain that success, you need to take care of lots of things. Selling a digital music online is a bit hard; it is not as easy as selling fashion or clothes in the eCommerce store. But thanks to the most popular WooCommerce plugin. With the plugin, you can showcase your music in a perfect order and manner. WordPress is one of the most popular Content Management System that lets you create a site without writing a single line of coding. Any newbies can easily configure the theme customization options and create a handsome site in a few spans of time. WordPress offers hundreds of free and premium music WordPress theme. It is better to go for the premium one as it contains tons of features and functionalities than free music WordPress theme. Having an audio player and blog page is not enough to sell music online. Well, there are some free music WordPress themes which are doing pretty good. There are also digital music selling websites like iTunes or Bandcamp from where you can always sell your music. If you are really thinking of selling music precisely and want to achieve a level of success, then better go with premium ones. Because they have an advanced music player, music page, booking section, and other important elements created keeping music in mind. One of them is Sungit Pro. Sungit Pro is one of the best premium music WordPress themes integrated with the WooCommerce plugin. This theme perfectly allows you to handle gigs, music, video, concerts, events, tours and much. Not only you can sell online music, but also sell merchandise, tickets, accessories and so on. WooCoomerce plugin is one of the most prominent eCommerce plugin, that comes with tons of extensions and add-ons; which means your music selling website will be more powerful and functional. Web Hosting is the home of your website which stores your data and files on the web servers. It shows your website to the public. The main thing you need to consider while selecting a web hosting is how much traffic you think your website will bring in. Based on that you can choose different plans that the hosts have to offer, for your business listing website. Or take a look at best web hosting services compared if you need some ideas. You probably have a WordPress Theme in mind for your music store. If not, then you can go with Sungit Pro, Premium music WordPress theme. It has all the essential features and is integrated with the WooCommerce plugin that will surely take your music website stand out of the crowd. This means you can use WooCommerce extensions like payment gateways, product table, shopping carts without missing its beat. As a matter of fact, Sungit Pro is quite easy to install and configure its theme options. You don’t have to worry about coding and hassle customization options. Undoubtedly, there will be a professional and a full-fledged music selling website in less than an hour. Similarly, the theme has a sleek framework, that takes your music website into the next level. Furthermore, you can introduce your new albums or music to your visitors or even send notification about your upcoming concerts or gigs to your fan followers. What’s more? You can even start marketing about your records, tickets, tours, and merchandise. Have you ever seen websites selling several band’s tees, accessories and so on? If yes, then you could be the next. Once you have purchased a theme, you will receive an email which contains all the necessary files. First, open up your email and download the necessary files. Now, remember there are different files available for download. Let’s take a look at what they all are. The one that reads “Package” is a package file. It has the theme, the plugins, and documentation inside it. The other one is “Theme Only” file. This is what needs to be uploaded to your “themes” section. Using your FTP program, upload the unzipped theme folder into the /wp-content/themes*/ folder on your server. Navigate to Appearance > Add New Themes > Upload. Go to browse, and select the zipped theme folder. Hit “Install Now” and the theme will be uploaded and installed. Once the theme is uploaded, you need to activate it. Go to Appearance> Themes and activate your chosen theme. Then install required and recommended plugins. I.e WooCommerce, Yudlee Themes Essential and YITH Event Tickets for WooCommerce. After selecting the music WordPress theme, now its time to install the WooCommerce plugin. This is what your Admin Panel looks like. On the left of the panel, there is a plugin section. Now Click Plugin>Add New>Type WooCommerce>then Click Install. Or, you can also click upload plugin, and select.zip file (WooCommerce) from the computer (either download WooCommerce form WordPress.org or WooCommerce website) and then click Install Now. Once installed, activate it. To activate it go to installed pluings>activate WooCommerce. After activating WooComerce it appears on the left side of your Dashboard. Is it hard? I guess not, still confused, then go through WooCommerce Documentation. Now its time to add music. Don’t worry the process is so simple. Of course not trying to sugar coat. To add music go to products>Click Add new. It appears like this. Scroll down until you find a product data section. This is the section from where the actual magic begins. 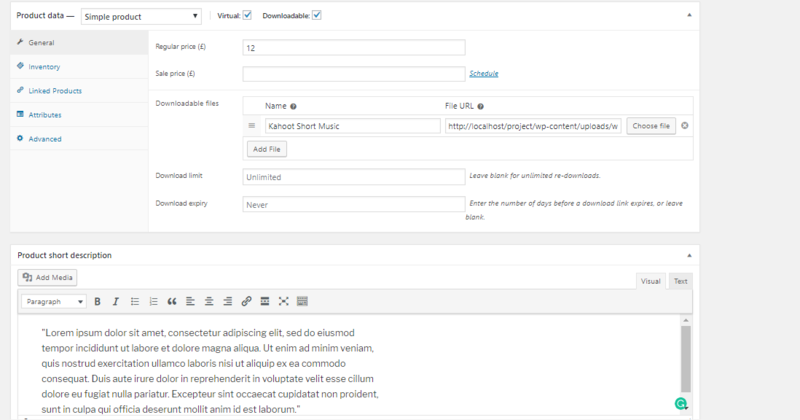 First Add Product Name, then click Virtual and Downloadable, then only you will get an option to upload your music files. Then, add price and upload your music files (either album or individual). Your customer will receive the downloadable file after purchasing the item. You can also set a download limit and expiry. Remember to choose Embed Media Player under Embed or Link. After setting everything up, then click publish. Repeat this process to add your audios, albums or anything you would like to sell in your store. For eg. I upload “kahoot Short music”, added its price and description as well. At this point, your site is ready to sell music. Now your visitors can purchase your music by clicking the “Add to cart” button. Without any payment gateways, your visitors cannot purchase online. Integrate your site with the most secure and swift payment gateways, so that your audience can purchase your music without any hurdle. Some of the most secure payment gateways are, Paypal, Stripe, and Authorize.net. Once you integrated WooCommerce on your website, you can easily download WooCommerce Payment gateways extensions. If you have followed the tutorial well enough, you can now easily sell music online with WordPress and WooCommerce. If you want to add further possibilities to your music store, then take a help from WooCommerce extensions. Still confused or need help? Don’t worry, feel free to mention it in the comment section. We will gladly help you.